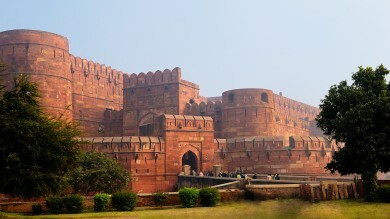 Less than a day’s journey north of Delhi lies the alluring state of Himachal Pradesh, one of India’s most popular tourist draws. Pushing on into the state beyond the colonial-era hill station of Shimla, you come to Manali, the jumping off point for the breathtaking but relatively easy Hampta Pass Trek. Famed for spectacular Himalayan landscapes that change dramatically as you progress and combining stunning mountain scenery with four or five days of manageable walking, this route is an irresistible option for novices and experienced hikers alike. 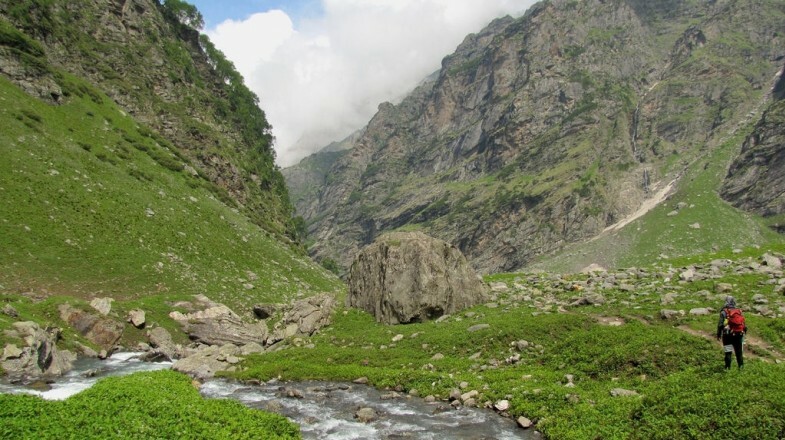 Start/end locations: The trek begins at Jobra, a short two-hour drive from the well-known tourist town of Manali. Trekking ends at Chhatru. 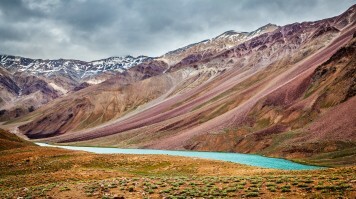 Many tours include a visit to Chandra Tal, a picturesque moon-shaped lake, by car — weather conditions permitting. After camping at either Chhatru or Chandra Tal, transport is arranged for the trip back to Manali. Moderate. Most of the walking is relatively easy, following established paths, but the climb up to the Hampta Pass itself is more challenging. Coupled with this is the fact that most of the trek takes place at around 3,000 – 4,200m, high enough for altitude sickness to set in, potentially adding to the difficulty and discomfort levels. At certain points, it is necessary to cross mountain rivers. Trek duration: 5 – 6 days. Total distance is around 30 km. Remoteness: Remote. The route heads up into the mountains where there are no tourist facilities, tea houses and no mobile signal. For the most part, the paths are well-established and easy to follow. Accommodation type: Accommodation is in tents along the way. There are no official campsites, although the places where groups camp are well known. Best season: The best time for Hampta Pass trekking is between June and the first week of October. Temperature stays between 12 to 20° C during day and can drop to -2° C at night. At this time, the weather is dry, but snow has not yet begun to fall, and temperatures do not drop too low. Permits required: None. But it is strongly recommended to attempt it only with an experienced guide. 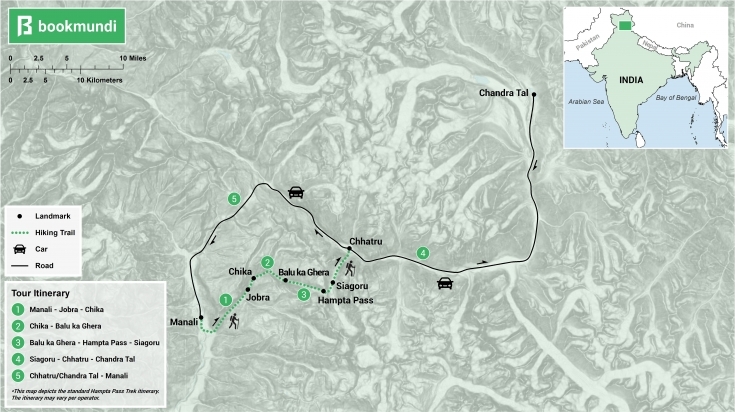 Day 1: Manali – Jobra – Chika: The first day includes a 2-hour drive from Manali to the start of the trek at Jobra. From there, it is a short half-hour walk of around 2 km to Chika and the first night’s campsite. Day 2: Chika – Balu ka Ghera: The second day’s walking is slightly more challenging than the previous day without ever becoming too taxing. The campsite at the end of the day is at Balu ka Ghera. Day 3: Balu ka Ghera – Siagoru via the Hampta Pass: This is the hardest day. Walking starts off gently, but the section leading up to the Hampta Pass can be quite tough. From the top, it is possible to see the peak of Indrasan with its impressive glacier. After this, a moderately easy descent brings you to the next campsite. Day 4: Siagoru – Chhatru – drive to Chandra Tal: The last day of hiking brings you to Chhatru from where you take a 3-hour car drive to the moon-shaped lake of Chandra Tal, weather permitting. The night is spent at either Chhatru or Chandra Tal, depending on the tour and the conditions. Day 5: Chhatru (or Chandra Tal) – Manali via Rohtang Pass: The final part of the trip involves transport by car back to Manali, either from Chhatru or Chandra Tal, depending on where you camp on the last night. Check out these 5 day, and 7 day tours for Hampta Pass Trek. Most treks follow the same route and stop at more or less the same places. However, another possibility is to do the trip in six days rather than five. This would include leaving from Manali and driving to Jobra, where you spend the first night. The second day you trek to Chika and continue on to Jwara and the second camp. The third day takes you to the camp at Balu ka Ghera, and after this, the trek is the same as other versions. The advantage is that the first three days are easier, and you also have more time to acclimatise, leaving you in better shape to tackle the Hampta Pass on the fourth day. This might be a better option for those worried about their physical fitness. Over 60 government and private buses run from Delhi to Manali daily, taking around 16 – 17 hours. Prices are in the range of around USD 10 – 15. Buses from Shimla take around 9 – 10 hours and cost around USD 8*. 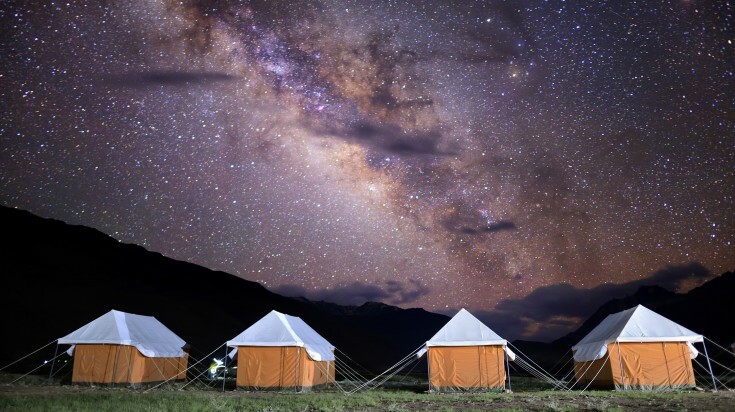 There are also plenty of connections with other nearby tourist destinations like Leh, Dharamsala and Kullu. There is no train station or airport in Manali, making bus the preferred means for transport to the town. 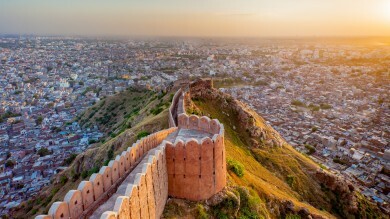 If you plan to attempt this trek, it is best to book a tour in advance since tour operators are often willing to offer discounts for early reservations. It is possible to do the trek independently, but you would need to organise transport to Jobra and then a pickup from Chhatru at the end. You would also need to organise transport to Chandra Tal if you want to go there. For this reason, it’s much simpler just to hire a guide or join a group. This way, these considerations will be taken care of for you. Trekking with a guide also means you won’t run the risk of getting lost in the mountains. As part of an organised tour, you will also not need to worry about meals while you are trekking. Carry a bottle to refill it at available water sources. Himalayan water is considered clean and safe to drink but it is best to carry purification tablets with you to be on the safe side. While this trek is suitable for beginners, you will enjoy it more if you are in reasonable shape. If you plan to trek this route, you should consider undergoing a modest training programme beforehand. This trek does not reach extremes of altitude, but the route is high enough for altitude sickness to set in. 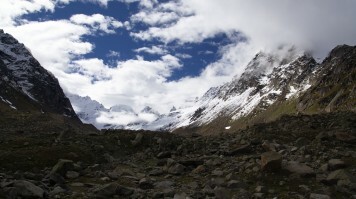 The maximum altitude reached, the Hampta Pass itself, lies at around 4,300m. This means spending a couple of days acclimatising in Manali before attempting the trek is advisable. There are no toilets along the route and trekkers need to use a ‘dry toilet’ — which means digging a hole in the forest and then filling it in after. The mighty Himalayas boast some of the most imposing and spectacular scenery anywhere on the planet. For those looking for a taste of these majestic mountains on a moderate but not overly strenuous trek, a trip up to Manali to attempt the Hampta Pass Trek could prove to be a memorable experience.